My husband, son, and I are planning to build a coop. We would like to have a good source of eggs for our family, and perhaps meat.... not sure about that yet. I think I can butcher a chicken with no problem, but I'll have to try it and make sure! We live in South Alabama (near Auburn) and are trying to decide what breed of chicken will best suit our needs (and neighborhood). We have to make sure there is no smell! We've been told by quite a few people that if we can keep our chicken run covered so that the ground isn't wet all the time, that we can keep the smell down. Apparently wet runs cause smells... On New Year's Day we visited Red Roof Hens in Hamilton, Georgia and purchased 2 frizzle cochins, 2 standard cochins, 4 orpingtons, and a silkie. We're growing them in 3 brooders in our dining room. The cochins are beautiful with their feathered feet, but we really think we want to go with Blue and Black Orpingtons. They are so very quiet and friendly. And they have clean feet. The beautiful feathered feet of the cochins are very hard to keep clean! We're keeping our cochin chicks in a 100 gallon aquarium in the dining room. It's working really great! We've put paper towels in the bottom of the aquarium and it is very easy to clean. Update 2/19/11. We have chosen a breed! We are going with Jersey Giants. And yes, I realize that this is quite a difference from the Orpingtons we chose at first. My husband just couldn't resist these huge chickens! The roosters can grow as much as 3 feet tall and weigh 20 pounds or so, although I understand the Jersey Giant Standard says the roosters should weigh 13 to 15 pounds. We bought 12 Giant chicks at the Newnan poultry show today and have ordered 18 more from a breeder in Indiana. We are joining the Jersey Giant club soon and would like to find some white Giant chicks but we only found blacks and blues so far. But now, in addition to the brooders in the dining room, we also have brooders in the laundry room! Update 2/28/11. We decided we want to try using silkies to hatch our eggs instead of buying an incubator right now, so we bought 6 blue/black/splash silkies from Shannon at Red Roof Hens today. Now we have 4 cochins living in a 100 gallon aquarium, 2 orpingtons and a silkie in a brooder, and 2 orpingtons in a separate brooder, all in the dining room. We have 12 blue and black Jersey Giants living in 2 brooders in the laundry room, and 6 silkies living in a brooder in the laundry room. 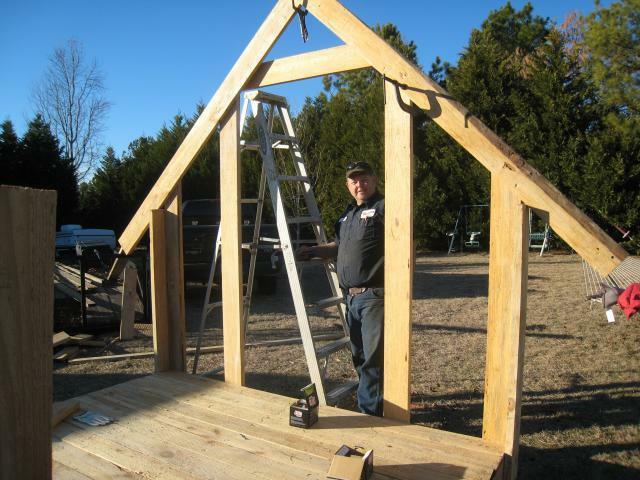 I am soooo ready to get the chicken house finished and get these chickens outside! We have large black plastic garbage cans with lids lined up in the dining room that hold two different types of starter food, a bale of wood chips, and a bag of cracked corn and rye grass seed that a farmer friend gave us to try feeding our chicks as treats. Those big garbage cans are a life saver! We also have another big garbage can in the house that we use every night when we clean the brooders. It is very convenient to be able to dump the trash from the plastic bins straight into the garbage, and the top of the can is so large that you don't dump food/poop everywhere. We're starting a compost pile in the yard to handle all this great refuse! The other thing we've learned is that you always need to have one or two extra (empty) plastic tubs/brooders. That way, we can put the paper towels, water dispenser, feeder, roosts, etc. in an empty brooder and just move all the chicks to the clean brooder. Then we clean the dirty brooder, set it up, and move the next chicks into that clean brooder. We haven't found any easy way to clean a brooder while leaving the chicks in it. We've found that for little chicks for the first month or so, paper towels in the bottom of the plastic tubs work best, then when they get bigger, we're switching to a shallow layer of wood chips. Update 3/18/11. We've realized we have 3 Orpington roosters and 1 orpington hen, and we have 2 cochin hens and 2 cochin roosters.... we need more hens. Shoot. We're trying to decide whether to buy pullets or whether to wait and just hatch some eggs, because our 3 hens should be laying soon. We need to be careful because we have 18 1 month old chicks in brooders in the laundry room, and the Jersey Giant breeder in Indiana will ship us 18 more chicks soon. We have to make sure we don't have more brooders than we can handle! 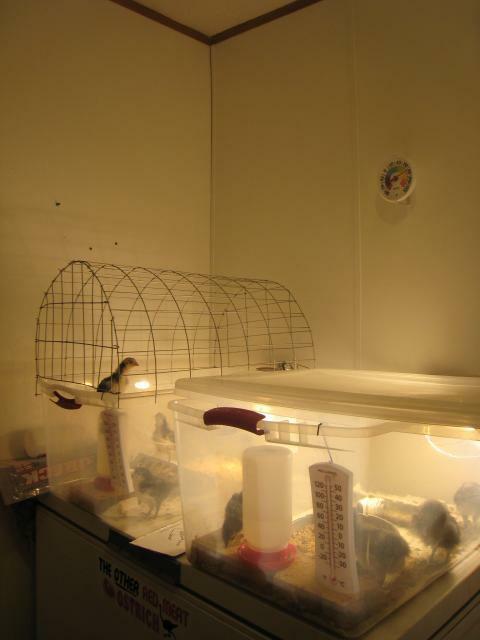 CHICKS JUMPING OUT OF BROODERS:: We've started having a problem with the Giant chicks jumping up on the edge of the brooders, so my husband built these nifty wire tops to go over them. After he built this first one, we realized that all the wire rectangles have to lay down flat (like the sides) because the up and down ones (on the front panel) are so tall that the chicks can still jump up on the edge of the brooder and walk right through them. We're using this wire top for some of the Orpingtons right now, and my husband built new tops of the chickies with all the wire rectangles laying down. And now that these chicks are getting sooo big, we've got to get moving on that chicken house!! We have a sawmill, so we decided to cut our own wood for the chicken house. The only problem is that it won't be treated lumber, but we're going to paint it with wood preservative. 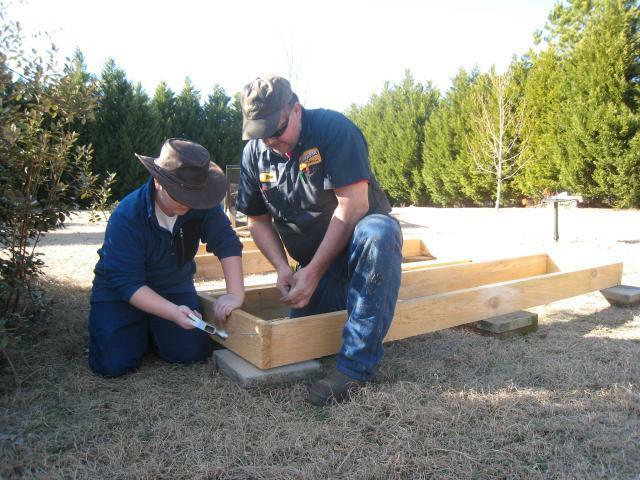 Here my husband, Blue, and my son, Logan, are building the platform for the floor. Notice we set it up on patio blocks so it won't be flat on the ground and we can get ventilation under it. Yeah! 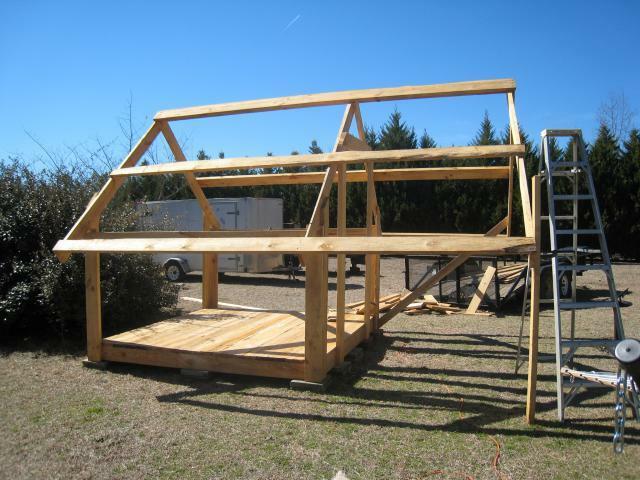 The roof is framed! 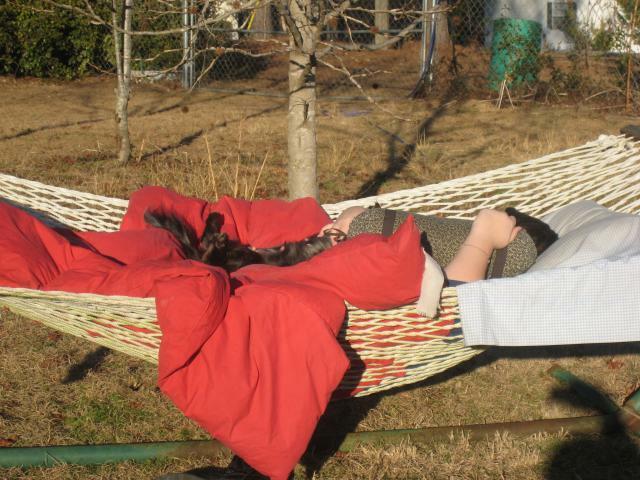 Logan and his dog, Oreo, are taking a break! 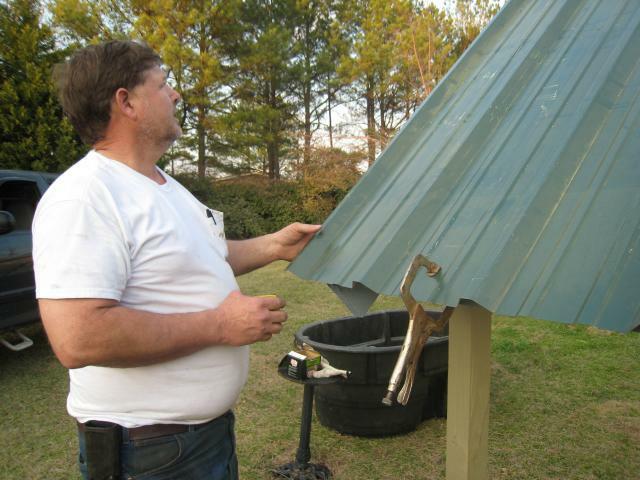 We were afraid that the metal for the roof would be one of our largest expenses. However, a farmer friend of ours recently built a new metal barn. When the company shipped the metal for the roof, they put smaller sheets of what they called "scrap" sheet metal roofing on top of the load so that the straps tying it down wouldn't damage the metal. 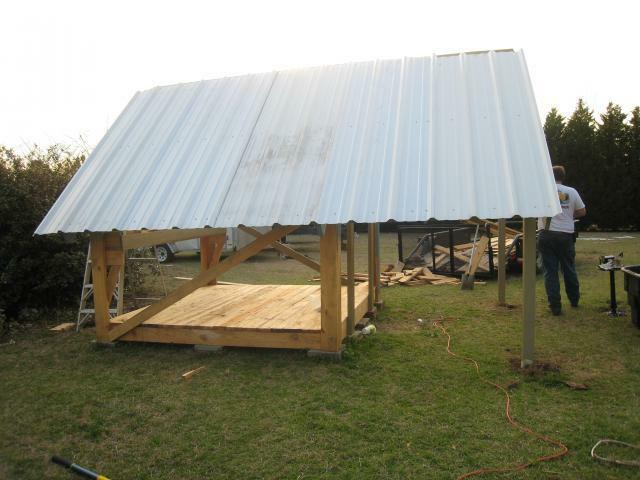 Jeremy gave us all the "scrap" metal roofing and it was enough to roof our whole chicken house! 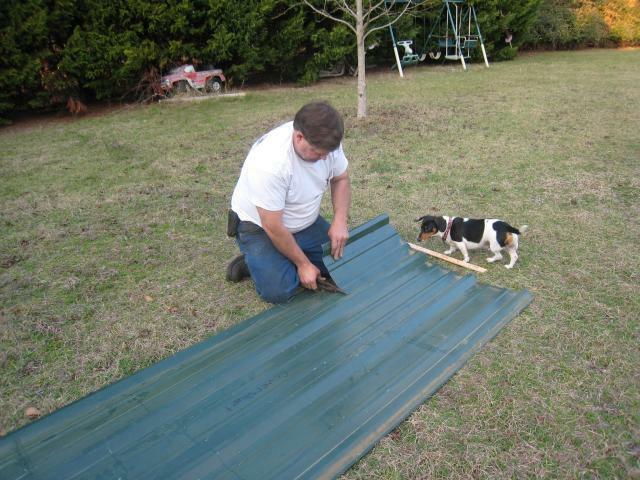 Here Blue is measuring the length of the roof to make sure he cuts the metal the correct length. 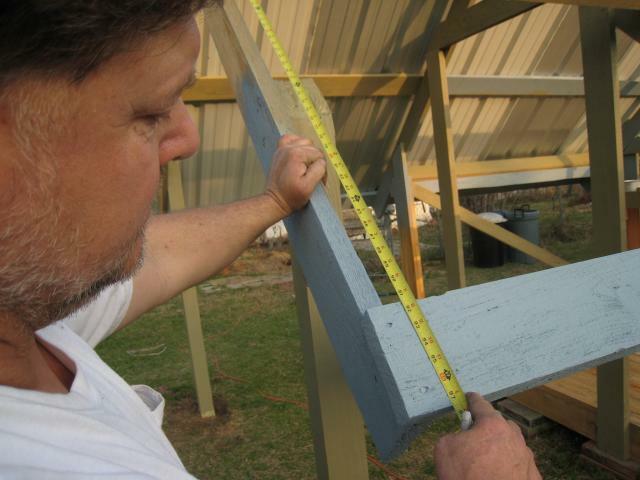 He measured every section separately before he cut it. Blue used a big clamp to hold the metal in place while he screwed it down. 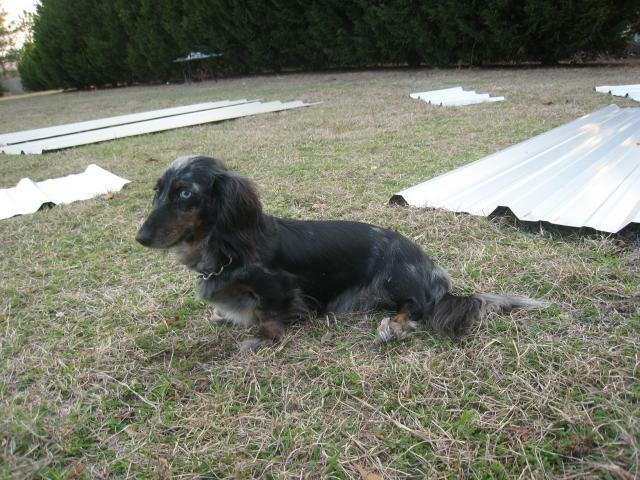 This is Star, Blue's long-haired double-dappled dachshund. She's a bit frustrated that her daddy is too busy to hold her! On the front side, the roofing is alternating white and silver sheets. However, during the daytime you can't tell the difference between the looks of the white and the silver. However, if you walk in the chicken house and touch the back of the sheets you can tell a huge difference. The white sheets are barely warm at all, while the silver are pretty hot. However, on the back we had to rotate between green, cream, and white sheets of metal. I can tell you, we are painting the roof of our house white! The green metal roofing gets too hot to touch, while the white roofing barely radiates any heat! Even the cream roofing gets fairly warm. I was very surprised by the differences in the amount of heat the different colors collect. We got the wire put around the house today. We wrapped the whole house in chicken wire, then we wrapped heavy-duty farm fencing around the chicken wire. I'm worried about feral cats being able to poke their legs through the wire and pull the chickens through the wire. I believe the layer of chicken wire will stop that from happening. Update: 4/21/11 Now the plan is for this house to become my Orpington/Cochin house, and my husband is building a totally different, much BIGGER house for his Jersey Giants!